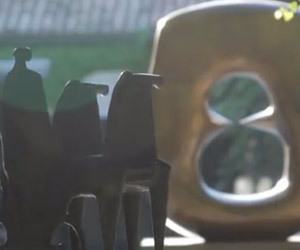 One of the most visited attractions in Venice is the Peggy Guggenheim Collection. It is housed in the 18th century Palazzo Venier dei Leoni. The white Istrian stone building is easy to spot as the odd one out. 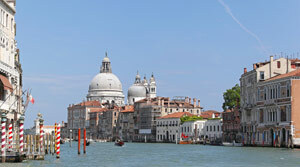 Simply it is lower in elevation than the other palaces facing the Grand Canal. Lorenzo Boschetti, the architect, intended the building to be taller, but it was left unfinished which has provided an ideal setting as a more modernist cube softened by a rare view on the canal: Trees from the garden behind. In all its perfect imperfection, the title of the building suggests lions. Again it points to a grander vision from its originator. But the missing greatness found its way to the property later when the private art collector Peggy Guggenheim’s moved in with her lion’s share of abstract expressionist and modern European art. Peggy Guggenheim, a well off American heiress, dedicated her life to art appreciation and patronage. She was a well-travelled talent spotter of great art and is credited for being the one who first recognised the potential of Jackson Pollock. Moreover, she was the wife of dadaist and surrealist artist Max Ernst between 1942-1946, and a niece of the mining magnate, Solomon R. Guggenheim. She collected most of her art between 1938 and 1946 on and industrial scale and in dizzying succession. De Chirico, Severini, Braque, Metzinger, Gleizes, Duchamp, Léger, Picabia, Dalí, Miró, Picasso, Brâncuși Max Ernst, Giacometti, Gorky, Kandinsky, Klee, Magritte, Mondrian, Calder and Pollock, Of course there are also a few paintings by Peggy’s daughter Pegeen Vail Guggenheim. The art collection also includes Futurist works on long-term loan from Gianni Mattioli Collection counting works by Boccioni, Carrà, Russolo and Severini. In 2012 the original collection was extended with 80 works from the Hannelore and Rudolph Schulhof collection that is now housed next to the Nasher Sculpture Garden. In 1951, two years after Peggy bought the building, the collection opened to seasonal public viewing. When Peggy Gugenheim passed away in 1979, the collection and palazzo were donated to the Solomon R Guggenheim foundation on certain terms. The foundation later decided to keep the art museum open all year round, and to double the exhibition space from 2,000 to 4,000 square meters. The art museum is now part of a family of Guggenheim Museums counting one in New York, Bilbao, and Abu Dhabi. 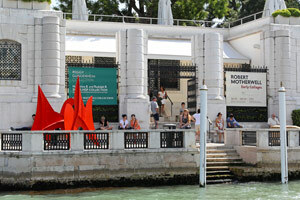 The venice location plays an increasingly important role in the American representation at the famous Venice Biennale. 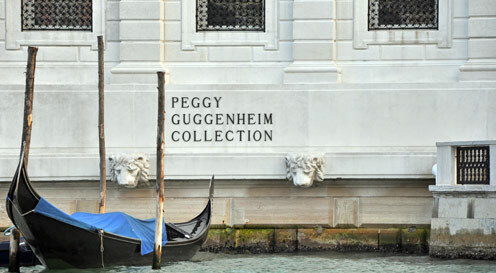 The Peggy Guggenheim Collection has over the years become one of the main attractions of Venice. With 400,000 visitors a year, it is only rivalled by the Doge’s palace in visitor numbers. It is certainly the most visited art gallery in Venice and the 11th most visited in Italy, which goes some way to explain the 2800 positive reviews on Tripadvisor that commends everything from the friendly staff to the quality of art. 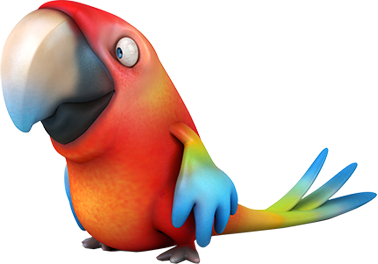 You can find out more by visiting the official website. See related Guggenheim articles about Guggenheim Helsinki, the Bilbao effect, and Guggenheim Bilbao.